In a bowl, crumble the tofu with your hands and let it marinate in the coconut aminos while you prepare the next ingredients. In a skillet, heat 1/4 Cup water and the kale. In a pot with a steamer, steam the sweet potatoes and mushrooms. Both of these won't take too long! Once the kale turns bright green, remove from heat. And when the sweet potato spirals and mushrooms get soft, remove fro heat. Place cooked kale in a little bowl and use the same skillet to heat up the tofu. As it's heating up, add the nutritional yeast and stir often so nothing sticks to the bottom of the pan. This way, you avoid using oil! As the tofu is heating up, mash the avocados with salt, pepper and lemon juice in a bowl. 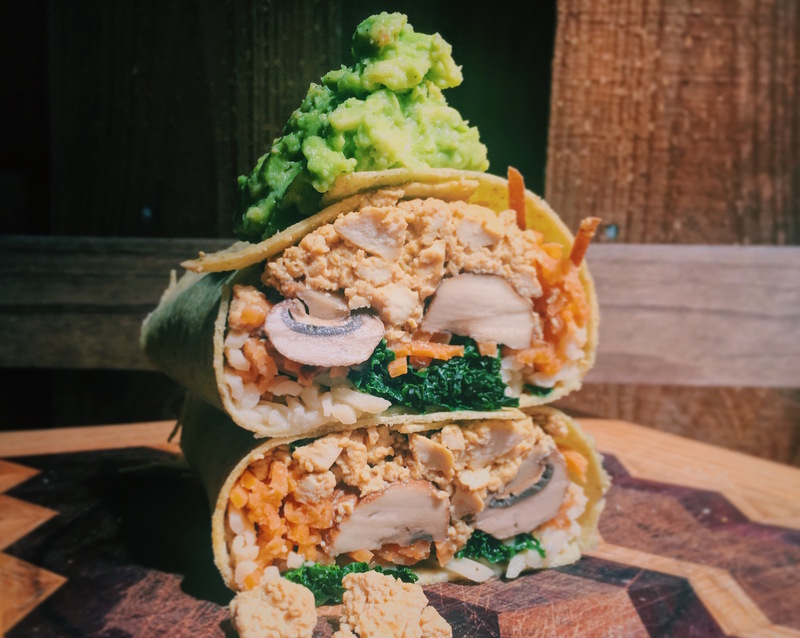 Assemble each burrito by layering: vegan cheese, then kale, then sweet potato spirals, then baby bellos, and lastly tofu. Roll up, cut in half and serve with the guacamole! The gluten-free tortilla wraps are most flexible when heated up a bit. I let my tortilla hang out on top of the pot where the spirals and mushrooms were steaming.